Way way back when I was a little girl, … oh somewhere around 11 or 12, I became very very interested in my mom’s sewing machine. Mind you this was in the 70’s. My mother had just made me a pair of slacks out of the coolest purple check fabric on earth! I loved the fabric so much that I was allowed to use my mom’s machine to make a small project. Which is what you see below. This his it my first sewing project. This is my first sewing project! I was so very proud of this. Believe it or not, it was the beginning of a wonderful relationship between me and sewing machines. As years went by, I continued sewing clothing and small objects for our house. Then one day, at about age 18 I was browsing in a book store when I noticed MCalls’ book of Quilting which stopped me dead in my tracks. On the cover, was a picture of a beautiful quilt. mcalls book coverNow mind you, I had never seen anything like this before. In my family, Grandma and Aunt Evelyn were crocheters. They made beautiful bedspreads, dresser scarves, doily’s, ruffled doll dresses, you name it. But quilts, never! I grabbed that book and immediately decided on the Grandmother’s Garden. grandmothers garden first quiltNow, when I look back at that decision WHAT WAS I THINKING??? Really, I had no idea what I was doing. Believe it or not, I did finish it. It was made of lining fabrics, cheap calicos and some type of stretchy background fabric. Needless to say, it had gaps, puckers and everything else that could go wrong but I finished it!!! Sadly, I did not keep it. It ended up in the shed for a while then it became a dog bed and finally the poor thing ended up at the dump. Flash forward to 1989, I am married to Bobby, the man of my dreams, living in VA. I graduated from Longwood University with a BA in Education. After a few years, Bobby and I had decided to start a family. After a few years of trying, we had miscarried 3 times. Finally, it seemed we were going to be parents! After carrying my baby for 3 months, I received a call from our doctor stating that our baby had problems. More specifically, he was diagnosed with Trisomy 18. This is a syndrome where the baby has misaligned chromosomes with fatal characteristics. Zachary was born on March 17, 1998. He lived 30 minutes then went to be with God until we can all be together. Needing something to immerse myself into, I entered a contest in American Patchwork & Quilting. The contest called for entrants to design a quilt to win a Viking #1+. I designed my first quilt for that contest. IMG_20131116_192952_7071This is that quilt. It was nearly 8 years before I made the decision to design after that. During the interval Bobby and I were blessed with our adopted son Trevor. He was 6 going on 7 and every bit an angel. A few years later, I wanted to make a wall quilt for a friend as a thank you. When I did, I realized how much I enjoyed designing and made the decision to do it more frequently. The designs were growing as I was. One particular design launched me into a new direction. Mustang Playground was that design. 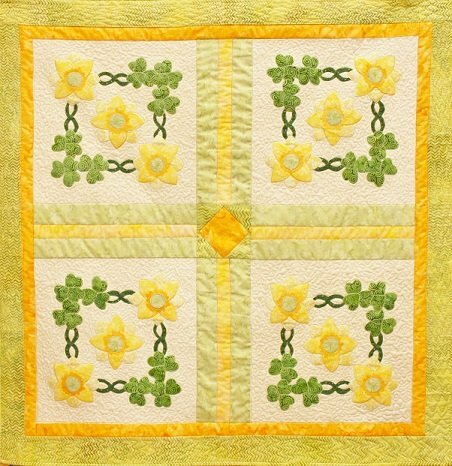 From that day on, I have had a wonderful time designing quilts with Press & Peel Applique. Now, my joy comes from spending time with Bobby and my critters, talking with Trevor and designing beautiful quilts for others to enjoy. mustang playgroundI look forward to a life filled with family, new designs and new friends to share them with.